for our son’s bathroom remodel. Here are some new photos (hopefully better than the ones I took two years ago…been practicing with my new camera) along with links. Long Beach, California flea market. The porcelain floor tiles (Seaside Boardwalk CY06) are from Daltile. They remind me of poured concrete. 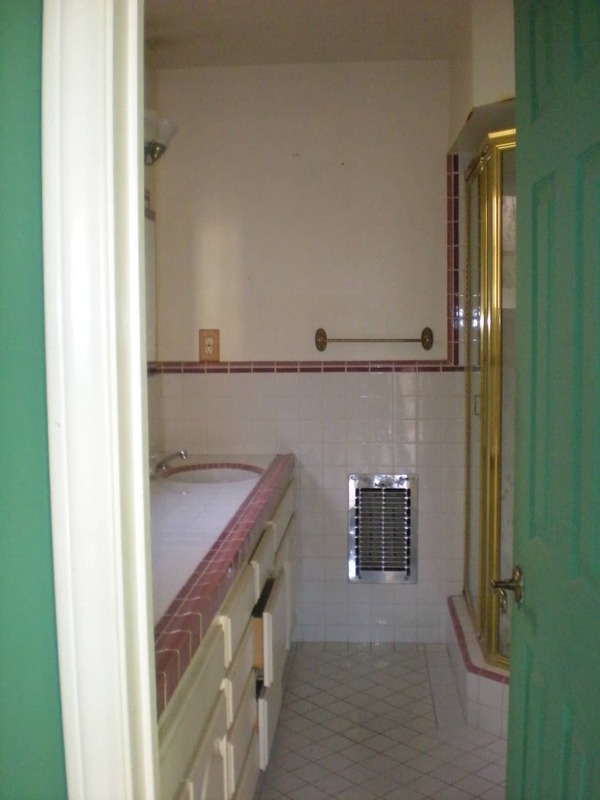 There are 12″ x 12″ tiles on the floor and 4″ x 4″ in the shower. 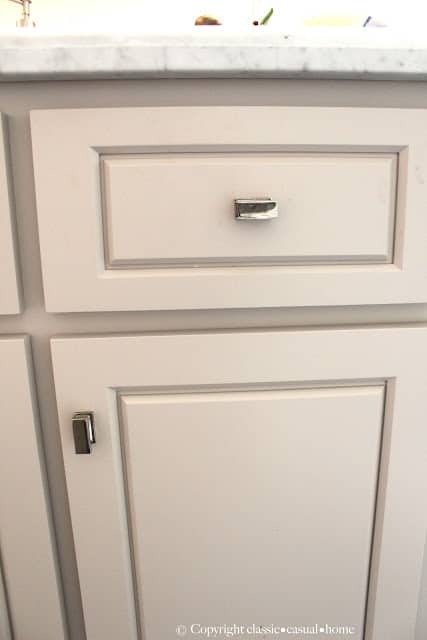 The white subway tiles are from Home Depot. The tile installer cut strips of the floor tile to accent the decorative herringbone insert. This is an inexpensive detail that provides a nice touch. 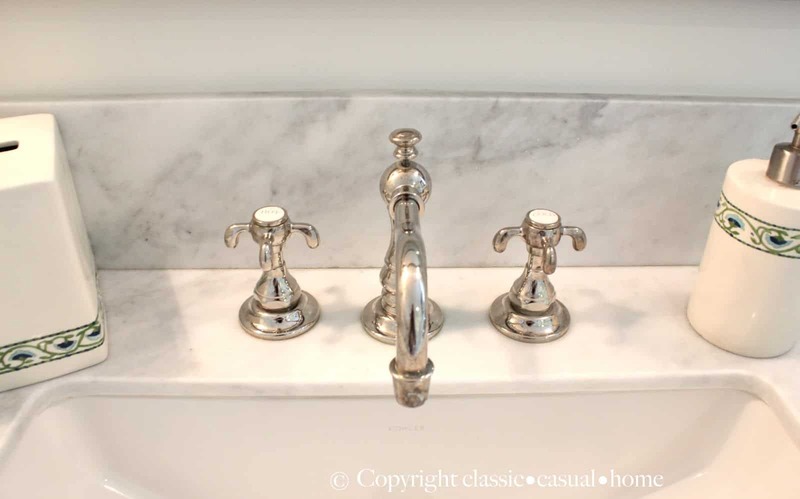 The polished nickel Strande knobs are from Restoration Hardware. 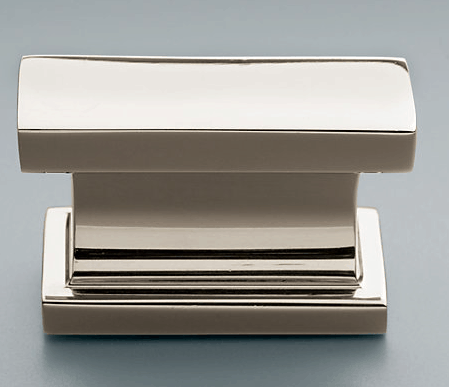 I like the rectangular design on this Kohler toilet. 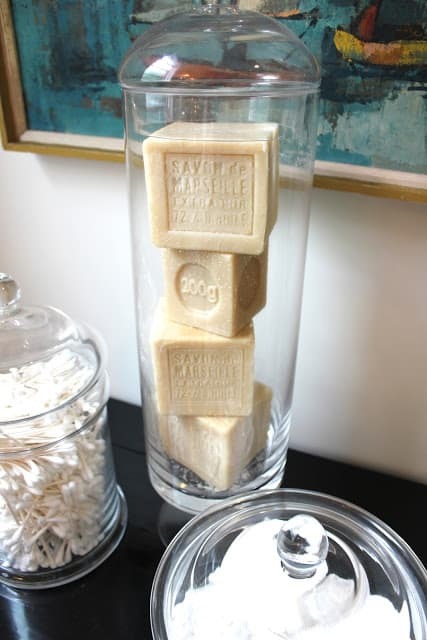 I try to pick up a couple bars of Savon de Marseille when I am in Paris. They smell so good! 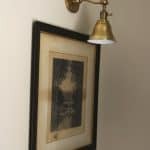 The nickel lighting sconces are from Circa Lighting. 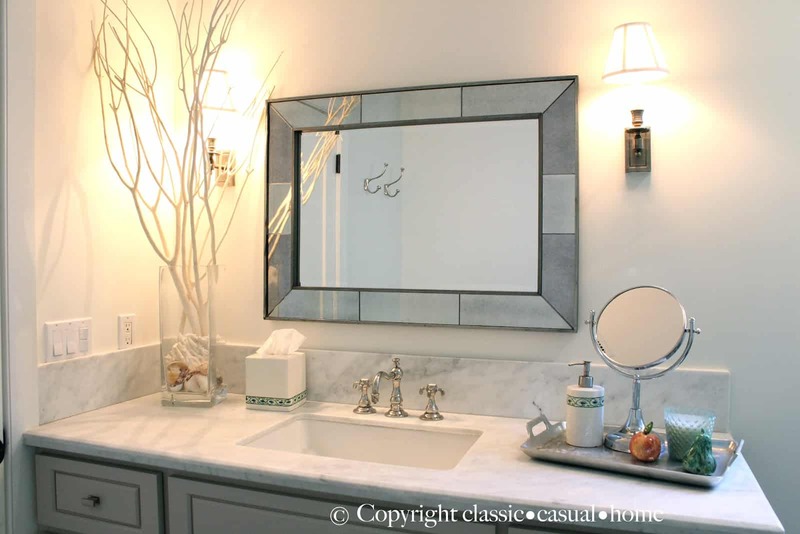 The mirror was from Pottery Barn about five years ago. It used to be above a dresser…repurposed. The walls are painted White Dove by Benjamin Moore. The polished nickel faucet is from Restoration Hardware’s Bistro Collection and the rectangular sink is by Kohler. 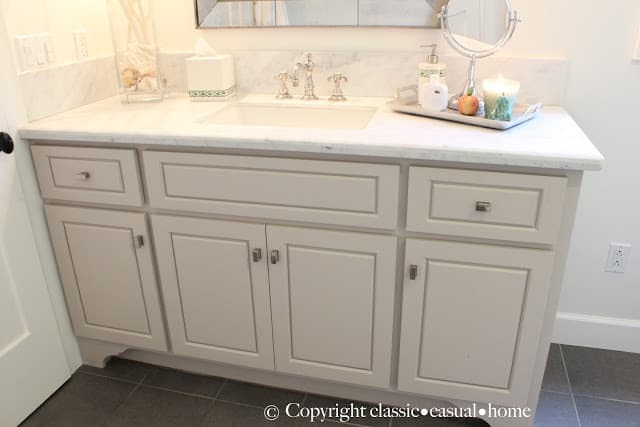 This vanity was custom built by Adrian Schroeder. 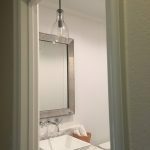 The paint color is Stone by Restoration Hardware. high school art class. I bought the candle last week at Target. It was only $9.99. Check out The Switch Studio Blog for bloggers homes as inspiration (thank you, Staci). 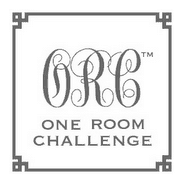 I’m participating in the One Room Challenge. to find out about all the fun details! 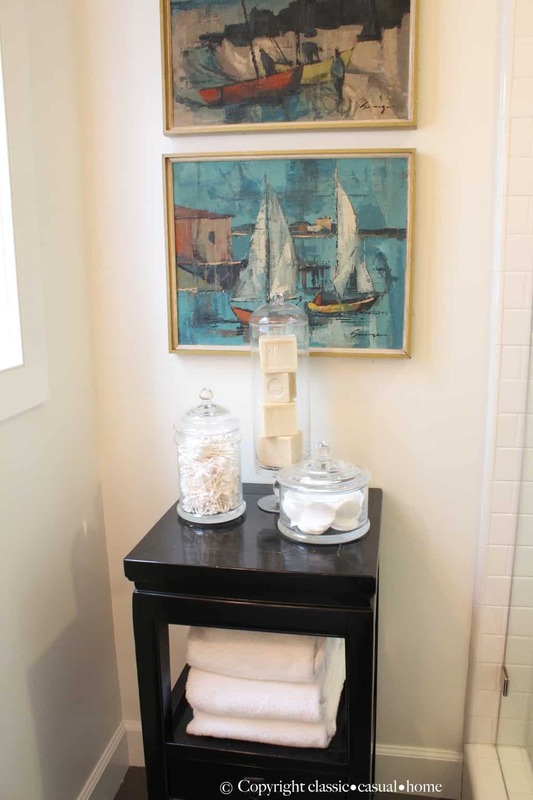 Coastal Bath Remodel and Other Fun Things in So. Cal. Your attention to detail is amazing! Beautifully done! That is a great camera. 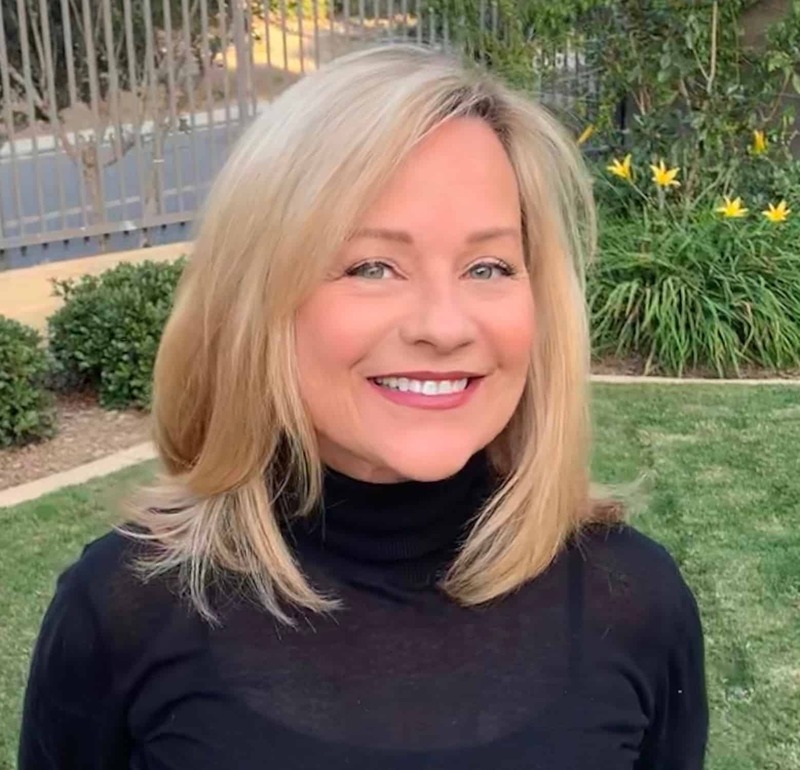 I love your photos….feeling a bit envious, in a good way. That bathroom really is great. Lovely Mary Ann. I hope you're having a great weekend. Great photos. Classic bath. Happy Sunday. Love this bathroom! Makes me want to do a little make-over in mine! 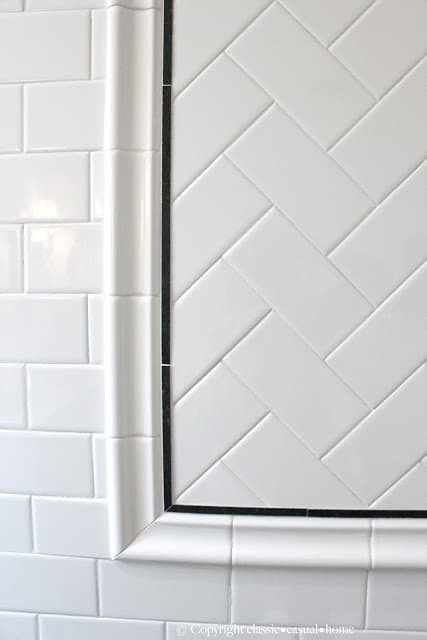 I absolutely adore the herringbone detail in the shower. 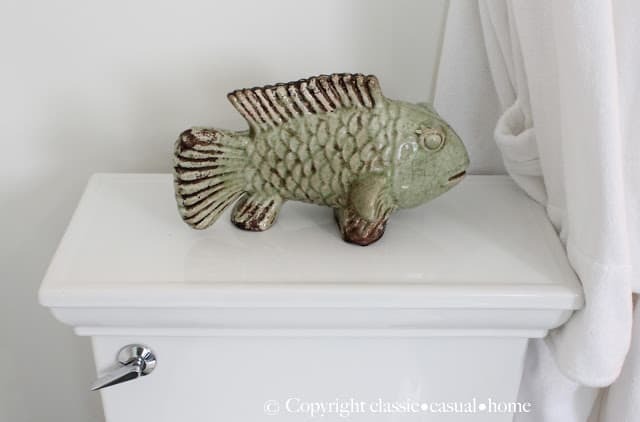 This detail will be on my "must have" list when we eventually remodel our master bath. I love how you see the possibilities!!! Your bath remodel is beautiful! 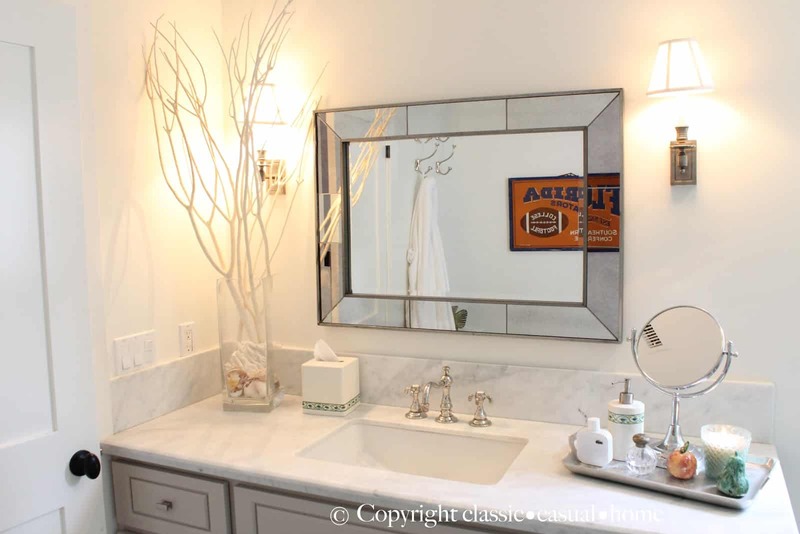 I like the beach theme and your fixtures are perfect. I am familiar with the bistro line at RH..love it. Thank you for sharing you sons bathroom once again. Your photos are great and you can see so much more of the beautiful details you included. 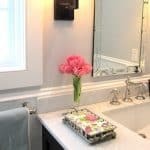 I would love my bathroom to look just like it and will definitely use yours for inspiration if I can get my husband to agree to a re-do!!!! 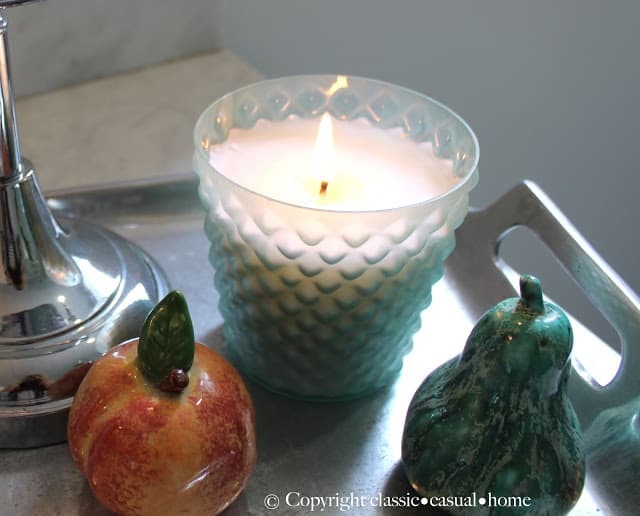 Oh, I forgot to ask…is that Carrera marble? Gorgeous! 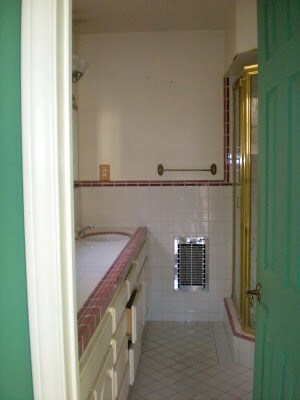 And so smart to use the floor tile for an accent in the shower! You are full of great ideas! You have done a very good job. 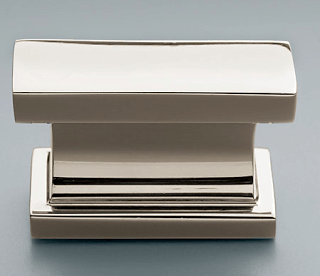 The rectangular knobs and sink give your bathroom a modern touch. Love the floor tiles and paintings. Beautifully done, as always, Mary Ann! Pretty contrast with the table and art! i really love those paintings in the bathroom. great finds!! Love the herringbone panel! 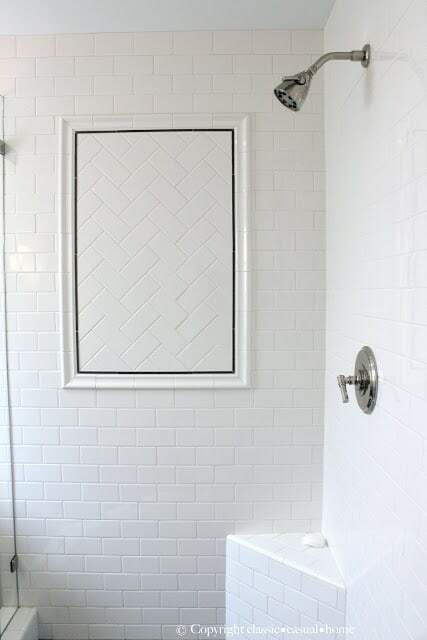 I used the same Home Depot subway tiles in one of our bathrooms. Very pretty and I love the detail around the shower tile. 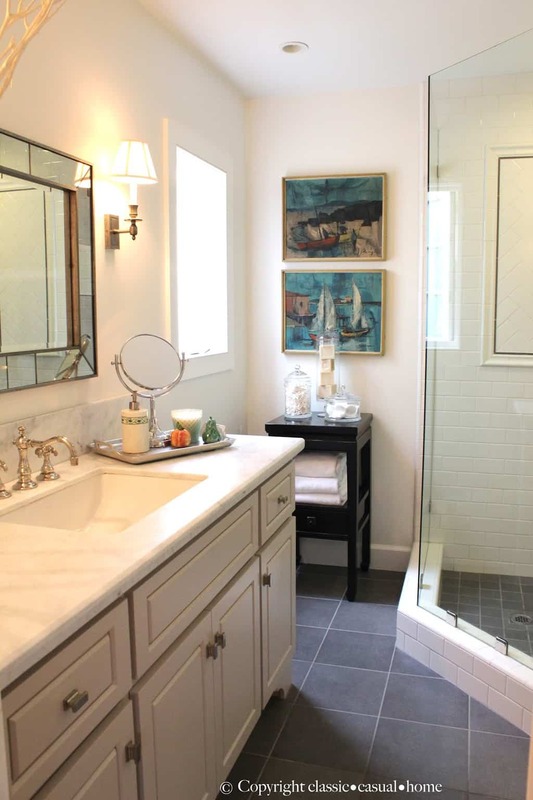 I love his bathroom and it is wonderful inspiration for us. What a great idea to use the floor tile around the herringbone insert!! Love all the little details. The herringbone pattern in the shower, the paintings from Long beach flea market (miss that market…you've scored some pretty great stuff from LB), the covered glass canisters and those soaps…and I adore Ali's ceramic fruit. You always add touches that are your own and so meaningful. I love that the most! What a difference! Wonderful choices, as usual! Good work!! I really appreciate your work.You did very hard work on your remodel project that's why your bathroom looking very beautiful.Thanks for sharing.Keep it up…..
What a beautiful bathroom. It's an awesome remodeling job. Round Coke bottle glasses, curly gray wig, fake pearls, bathrobe with a pillow stuffed under it, fuzzy slippers, hideous pink lipstick.